Jet Cities Chorus invites you to experience An Evening of Musical Mayhem, on Saturday, October 28, at the NEW Federal Way Performing Arts and Events Center. Our special guest is GQ Quartet, a female barbershop and contemporary a cappella quartet, who most recently was named the 2017 Sweet Adelines International 7th Place Quartet. Show times will be 2:00 and 7:00 pm. A limited number of Dress Circle/reserved seats will be available at each show, and the rest will be General Admission. Tickets go on sale this summer and will be available on-line through the Federal Way Performing Arts & Events Center. Watch this spot for an announcement when sales go live! You are going to love Federal Way's new performance hall and the location for our two shows! 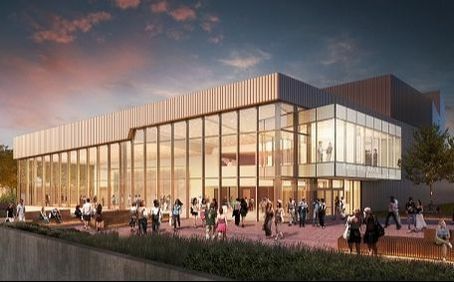 The Federal Way Performing Arts & Event Center (PAEC) broke ground in October 2015 and celebrated its grand opening on August 19, 2017. This spectacular one-of-a-kind, 44,000 square-foot center is located at the corner of S. 316th St & Pete von Reichbauer Way S in downtown Federal Way. The 716-seat theater accommodates theatrical, musical, dance, and spoken word performances from the region and around the world. Jet Cities is one of the resident performing groups at this new facility, and we are proud beyond belief to have this new venue right in our own backyard.